While many students already started the fieldwork for their projects at Camp 10 and even Camp 18, five students have been anxiously awaiting to begin their fieldwork in the Gilkey Trench. The Gilkey Trench is the magnificent view that you see from Camp 18 where the Gilkey, Vaughan-Lewis, the Unnamed and many other glaciers connect and flow down through the steep, glacially carved, 2,000 foot deep valley. The Trench is filled with beautiful curving medial moraines and jaw dropping ogives created by ice falls. Getting to such a beautiful place is not easy and well worth a full day’s effort. On Wednesday, July 31st, these students and four safety staff members departed Camp 18 for our camp on the bare glacier ice in the sunshine. The trick to getting to the glacier is descending what is affectionately called “The Cleaver.” The Cleaver is the 2,000 feet of bedrock that sits between Camp 18 and the glaciers below. The descent was led by senior staffer Scott McGee, who has done the route many, many times. The first half of the route was going down steep snow slopes until we got to a vegetated area called “The Heather Camp.” This is where the fixed ropes began. Waiting in a safe location - protected from rockfall from above - for their turn to descend the next section of fixed ropes. Photo by Adam Toolanen. Here, the students and staff put on helmets and harnesses and tied into the fixed ropes with a knot called a prussik. This rope system served as a back up in case there was a slip on the steep, unstable terrain. Fixed ropes were used for the last half of the descent because the route became steeper and more exposed. Because the glacier is melting, new bedrock and rock debris is left behind. This makes finding new routes difficult and challenging in the unstable footing. After 11 very long hours, the students and staff safely and happily arrived at our camp in the Gilkey Trench during a magnificent sunset. Scott McGee scouts the lowest section of the descent made of freshly exposed bedrock, and precariously deposited boulders left by the rapidly thinning Gilkey Glacier. Photo by Jeffrey Barbee. For my project, I looked at the ablation, or melt rates, of the Gilkey Glacier. In May 2013, wires were steam drilled into the ice for Dr. Anthony Arendt at the University of Alaska Fairbanks (also a visiting JIRP Faculty member earlier in the summer). My task was to find these wires and measure how much wire was exposed. Luckily the sites came with known GPS coordinates and had a wire tetrahedron with bright orange flagging attached to it, so it was fairly easy to find in the rolling, mildly crevassed terrain of the Gilkey Glacier. By knowing the length of the wire exposed at the time of installation (which I will find out upon returning to civilization) and measuring the length of wire exposed in August, the ablation can be determined. 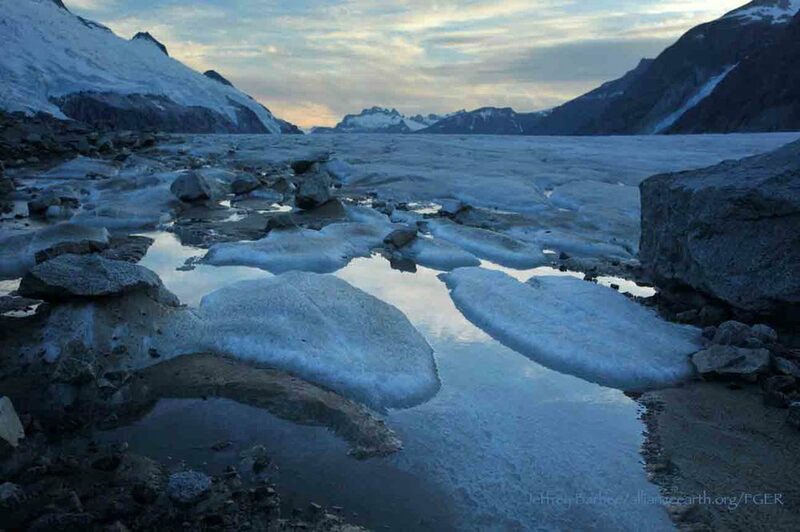 This becomes important because once the area of the glacier is known, the total amount of melt water runoff from the glacier to the ocean can be calculated. Jamie Bradshaw photo documents one of the ablation-measurement sites on Gilkely Glacier. As the glacier surface melts, more wire (at Jamie's feet) is exposed. Photo by Jeffrey Kavanaugh. My research in the Gilkey Trench was focused on the ogives, also called Forbes Bands, which form at the base of the Vaughan Lewis Icefall, adjacent to Camp 18. These interesting features in the ice are annual formations that only appear beneath fast flowing icefalls. It is commonly accepted that their light and dark banding represents the variations between summer and winter ice that has made its way through the icefall in one year. Summer ice, which is subjected to wind blown particulates and increased melt, constitutes the dark bands of the ogives and forms the trough of their frozen wave-like appearance. The white winter ice is composed of that year’s snowfall, and forms the crests of the wave bulges. William Jenkins surveys one of the Gilkey Glacier ogives with GPS. "The Cleaver" is the ridge of rock in the background, with the Vaughan Lewis Icefall on the right. Photo by Jamie Bradshaw. The purpose of my study was to determine how fast this area of the Gilkey Glacier was thinning in comparison to previous years. In order to determine this rate, I conducted a longitudinal GPS survey, with the help of Scott McGee, that had previously been carried out from the years 2001-2007. As a result of the glacier’s rapid thinning rate, I’ll be able to calculate its subsidence by the changes in the elevation of the survey over time. I will also compare the data I observe with the Vaughan Lewis mass-balance data that JIRP has collected over the years. This comparison will allow me to correlate the changes in annual precipitation with the transformations in the ogives wavelength and amplitude over time. The relationship between mass balance and ogive structure will shed light on the future transformations of the ogives and Vaughan-Lewis Glacier as a whole. 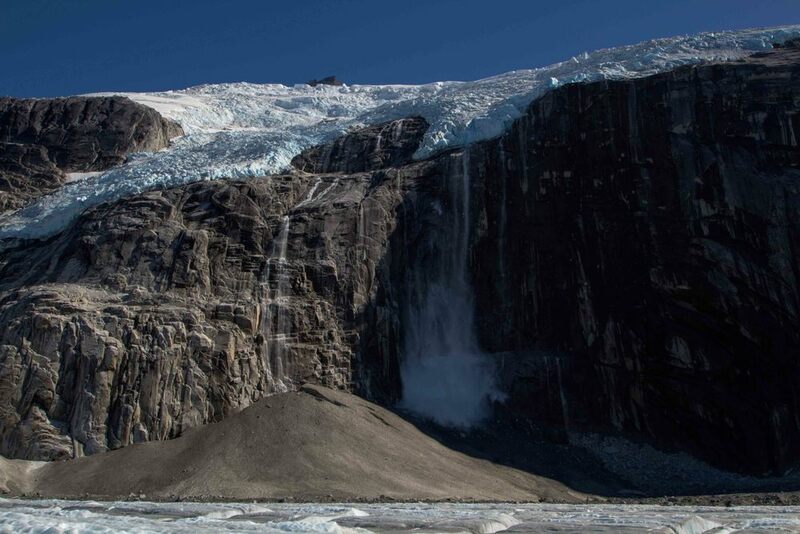 Panorama of one of the ogives near the base of the Vaughan Lewis Icefall (in the background). Photo by William Jenkins. The main objective of my project was to create an up to date digital terrain model (DTM) of the Vaughan Lewis Icefall flowing down from Camp 18 into the Gilkey Trench. A digital terrain model describes the 3-dimentional position of surface points and objects, and can be used to retrieve information about geometrical properties of glaciers. In order to create the model, I decided to explore the procedures and tools available within the field of digital photogrammetry, a practical method which allows carrying out non-contact measurements of inaccessible terrain (very useful for areas such as icefalls, which for the sake of avalanches and falling seracs, might be too dangerous for exploration or measurements on their actual surface). The baseline dataset for creating the DTM of Vaughan Lewis Icefall were recorded on the first, sunny and cloudless day of our stay in the Trench. With the guidance from Paul Illsley (present via radio from Camp 18) and help from my colleagues Jeff Barbee and Jon Doty (present on the Gilkey Trench), I set up the three profiles along which we collected the data in the form of terrestrial photogrammetric stereo pairs and ground control points (GCP). The database created by our team will be subsequently processed in order create a DTM which can constitute a reliable, starting point for further research in this area in the future. 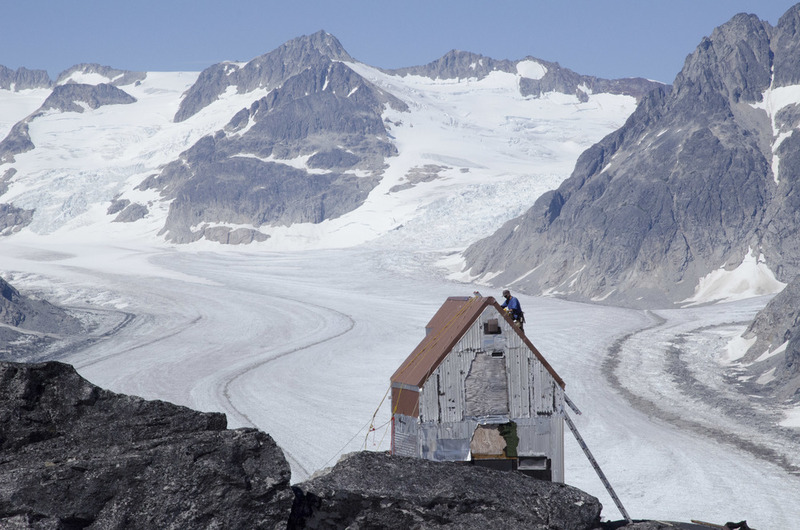 Paul Illsley overlooks the Vaughan Lewis Icefall from a terrestrial photogrammetry station near Camp 18. Photo by Mira Dutschke. My path into the trench followed a slightly different approach than the other students who reached the Gilkey Trench via the Cleaver descent. Ben Partan – Senior Staff member in charge of camp maintenance – and I were brought down to the Gilkey via helicopter from Camp 18 to Camp 19, with a load of material to fix up the camp, which sees infrequent use. After two days repairing the roof, and siding, as well as swamping the camp interior, we descended into the trench. During our descent we made four stops at progressively lower elevations, conducting a botanical survey. At each site I recorded all plant species present, the compass orientation of the plot, elevation, and tried to keep an eye out for faunal interaction, and any other interesting features of the site. Ben Partan repairs the C 19 roof. The upper Gilkey Glacier is in the background. Photo by Jon Doty. As we dropped down closer to the surface of Gilkey Glacier - biodiversity plummeted. My final site featured only a single species of plant, as opposed to nearly twenty at the highest point of my survey. This loss of biodiversity can be tied to the recession of the Gilkey exposing new substrates, and the time required for mosses and lichens to reach the area and for soil to develop. Using a rough dating technique called lichenometry, we can gain insight as to the amount of time each site has been exposed by the recession of the glacier. The lichen species Rhizocarpon geographicum grows about 1 cm for every 100 years and is very common. Its absence at the lowest two sites is therefore noticeable, and signals that these sites were only recently revealed. My survey is paired with another conducted by Molly Blakowski on the southerly oriented C 18 nunatak. These two slopes face each other with the Gilkey separating them. We plan on comparing the results of our surveys to determine what affects the differences of aspect have on the vegetation. It was an absolute pleasure to join back up with the group and explore the Trench, and true fun to climb up the Cleaver and reunite with the rest of the JIRPers at C 18. In closing, on August 3rd, the Gilkey Trench Crew packed up camp and headed towards the Cleaver to ascend back to life at Camp 18. Again, we tied into fixed ropes, had a remarkably beautiful day and had a safe climb up the Cleaver. The Gilkey Trench Fieldwork Adventure had been a success and possibly, the icing on the cake for all crew members.